We are pleased to announce the availability of Tizen 2.3 Rev2 SDK. We are pleased to announce Tizen 2.3 source code release which now includes support for the wearable profile. Developers and manufactures may utilize Tizen to their wearable devices based on this source code. The IVI team is excited to announce the availability of Tizen IVI 3.0 for In-Vehicle Infotainment. Tizen IVI 3.0 is a Linux-based open source operating system and Tizen profile widely accepted by the automotive industry. It bundles popular and well supported open source projects where suitable and new industry-specific components where no solutions existed. This makes it the most advanced open source distribution available for automobiles today. On 11 November 2014, Tizen IVI 3.0-M3-Oct2014 gained GENIVI 7.0 compliance approval on two platforms, the Nexcom VTC 1010-IVI and the MinnowBoard Max. Tizen IVI 3.0 is available in both 32-bit and 64-bit versions. Tizen IVI is an open-source solution for next-generation In-Vehicle Infotainment systems built on Linux. Tizen, the OS of everything, is architected from the ground up to meet the requirements of various types of devices such as Mobile, Wearables, IVI, TV. We are pleased to announce that Tizen 2.3 Rev1 SDK is now available via the SDK download page. Bug fixes for Network API module in Native API. We are pleased to announce that Tizen 2.3 SDK is now available including support for the wearable profile. Tizen 2.3 SDK is now available on the SDK download page. Tizen Developer Summit 2014 in Shanghai is a wrap! On October 20-21 the second Tizen Developer Summit took place in Shanghai, where hundreds of Tizen developers, app developers, ISVs, platform designers, operators, OEMs, hardware vendors, software vendors, open source enthusiasts, partners and students met at the Marriott Parkview Hotel. 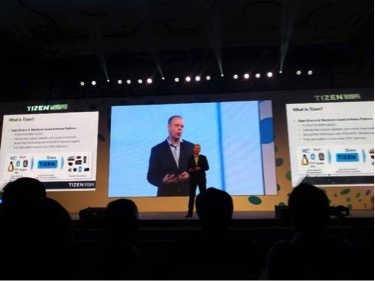 Read more about Tizen Developer Summit 2014 in Shanghai is a wrap! Tizen SDK for Wearable 1.0.0 is now available on the SDK download page. Tizen SDK for Wearable is a comprehensive set of tools for developing Tizen wearable applications. It consists of the Tizen wearable IDE, Emulator, tool-chain, sample applications, and documentation. Tizen SDK for Wearable runs on Windows®, Ubuntu, and Mac OS® X. We are pleased to announce that Tizen 2.3 Beta SDK is now available including support for the wearable profile.